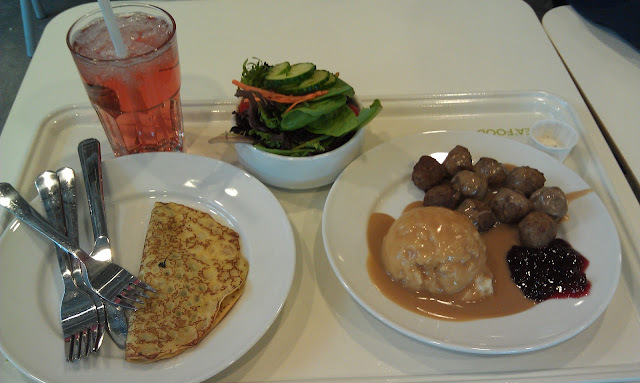 I think many people, like myself, visited the new IKEA in Richmond not because we want to buy furniture but because we want to try the food. This is the Meatball Combo ($4.99): 10 meatballs, 1 scoop of mashed potatoes, small salad, and a drink. This is the weekend price, on weekdays this combo is only $2.99! Probably cheaper than a McDonald's burger? The spinach and cheese crepe is not included in the combo ($1.99). Overall, yummy eats and great way to fill up for lots of walking in the store or a nice way to end your visit. Can't go wrong with low prices like these.